This is an exploration of some wonderful and sometimes daunting roads along the eastern flank of the Sierra Nevada mountain range, California’s spectacular, granite high country. It is a collection of mostly unconnected out-&-backs, each climbing into the mountains from start/finish sites in a succession of towns ranged out along Hwy 395, the main north-south artery on the eastern side of the Sierra. The miles, both for individual stages and for the tour as a whole, may not appear to add up to much, but take our word for it: these puny rides were more than enough challenge to make us feel as if we had done a good day’s work, day after day. It is certainly possible to connect the out-&-backs by bike by riding the mostly flat miles of 395 between each climb, but it only took us a couple of days to toss that plan. The climbs alone were plenty, and we used our cars to shuttle our way north, from town to town. Altitude is a large part of what makes these climbs so challenging. If you’re not acclimated to the thin air, you will soon discover your aerobic threshold, again and again. On the other hand, this tour makes for a great training camp, building that aerobic fitness, one high summit after another. The tour works from south to north through the towns ranged out along 395, from Lone Pine to Independence to Big Pine to Bishop, and finally on to Mammoth. The out-&-back climbs depart from each of these towns. We did it as a camping tour, but with all the towns along the way, it would be easy enough to stage it out of a nice assortment of inns or motels. 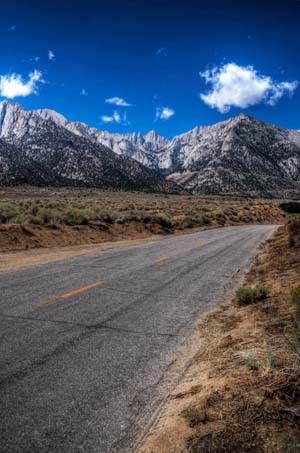 Climbs out of Lone Pine, through the rocky wonderland of the Alabama Hills, up onto the broad, steep face of the granite cliff, where the road carves a set of impressive zigzags across the cliff face, visible from the valley floor and intimidating to contemplate. Elevation at the highest point flirts with the 10,000′ ceiling. Here’s your first dose of deceptive numbers: 36 miles? Can’t be that bad! Well yeah, it can. After another meander through the super picturesque Alabama Hills, the climb slogs across a seemingly endless alluvial fan—treeless and barren—before finally grappling onto the steeper pitches up on the granite walls. Up near the top, the scenery is about as spectacular as it can get, with Mt Whitney and its consort peaks clawing at the sky. Another short but challenging day. Climbing out of the town of Independence, this great road wanders all over the mountainside in a series of loops and switchbacks and slinky bends. It’s more entertaining and diverting than the two previous climbs, and it all turns into one of the best descents in the world on the way back. Superb Alpine scenery throughout…at least once you climb above the barren alluvial fan. As you will see from the map, we initially planned to ride all the way to Independence (along 395), but after doing the first two days in heat over 100°, we wimped out and drove. This is the only climb that doesn’t head west from 395 into the Sierra. Staging out of the town of Big Pine, it heads east into the White Mountains, climbing to Westgard Pass and then onward (upward) to Schulman Grove, the visitor center for the Ancient Bristlecone Pine Forest, at an elevation of 10,100′. This is a more interesting climb in some ways than the Sierra climbs. It has less of that barren alluvial fan to cross and more rocky gorges and little ups and downs to add diversity to the cycling. And the descent on the way back is even better than the very good decent from Onion Valley. This one is about as good as a descent can be. We had planned to do a second, shorter climb as well, but it started to rain on our way down from Bristlecone, and that put a period on our day, after the one, big climb. Now we’re up to the town of Bishop for the next two stages. This one climbs at a relatively moderate grade to a junction where two roads lead to two lakes. Both are worth doing, and both become quite steep as you near the lakes. Classic alpine scenery around the lakes…as pretty as can be…and a nice mountain refuge on the shore of Sabrina, serving good food on a terrace overlooking the heavenly scenery. Two climbs: after a pleasant roll across the valley, a relatively easy ascent of Sherwin Grade, then a short decent, and finally a longer climb to 10,250′ Mosquito Flat, the highest paved road in California. On the way back, the Sherwin Grade descent is another world-class ripper…not too steep, but twisty and slinky in all the right ways. This short day is not as challenging as some of the others, but still will make you feel as if you’ve earned yourself a hearty, celebratory lunch. Staging out of the town of Mammoth, it begins with a climb up to and a loop around pretty little Mary Lake. It then descends back to Mammoth and climbs to 9175′ Minaret summit before plunging into the spectacular gorge of the San Joaquin River, down to Devil’s Postpile National Monument, amid the rugged peaks of Yosemite. This is an epic descent, and the climb back out afterward is not really all that difficult…big and long, sure, but not brutal. It’s a neat ride, and if you can contrive to have some walking shoes with you down in the gorge, you can make the day even better with a short hike to Devil’s Postpile.